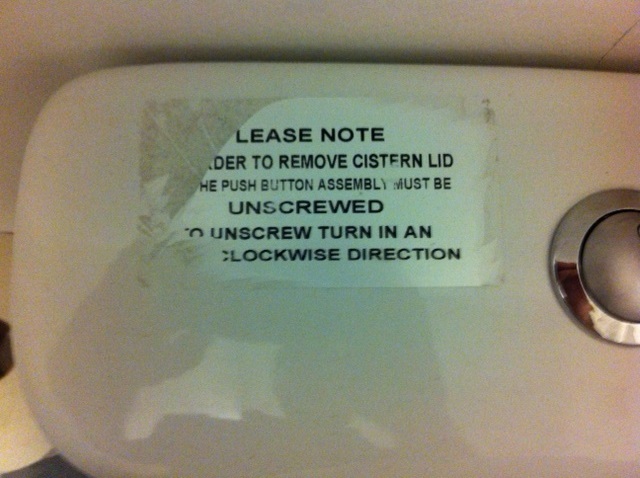 English is everywhere…even in the toilet! As long as you don’t think about its origins too much, this is a nice idea for a lesson. The overall aim is to get students into the frame of mind that English is everywhere (if your teaching in an English speaking country that is), it’s all around them and they can/should be noticing it…even if they’re in the bathroom. This is a quick lesson based on a half-ripped sign on the cistern of the toilet in school. It could be done at the beginning or end of a lesson. These sorts of mini-lessons could be done regularly (here’s another one on using a text message) to keep students thinking and noticing the language around them. They take very little prep but over time you can train your students to analyse chunks of language and hopefully they will start bringing in their own signs, emails and text messages for you to exploit in class. Procedure: You could do some or all of these. Identify the origin: get students to try to decide what kind of a text it is and where it came from. As a class discuss how they figured it out (language / register / how it looks). Gapfill: the sign is half-ripped. Get your students to fill in the blanks. The clues are all in the text. Encourage your learners to use them. (answers below). Reformulation: Rewrite the sign as a conditional sentence. Rewrite it in the active voice. Rewrite it as spoken advice to a friend.